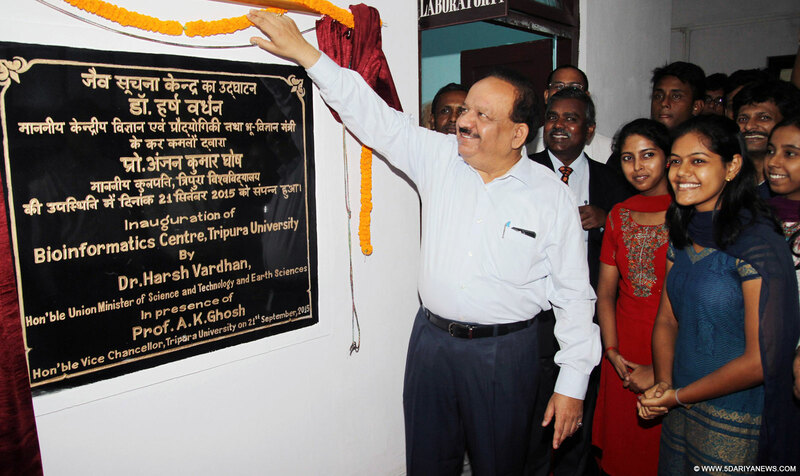 The Union Minister for Science & Technology and Earth Sciences, Dr. Harsh Vardhan inaugurating the Bioinformatics Centre, at Tripura University, Agartala on September 21, 2015. Government would strengthen the scientific infrastructure to explore and exploit the bio-diversity and bio-technology in the northeastern region, a central minister said here Monday.The northeastern region and adjoining countries of the Himalayan region are considered as world's major bio-diversity hot-spot. "The government would strengthen the scientific infrastructure to explore and exploit the bio-diversity and bio-technology in the northeastern states. The existing Bio-Technology Hubs and Bio-Informatics Centres in the region would be reinforced and new such centres would be set up," union Minister for Science and Technology, and Earth Sciences Harsh Vardhan said.He said: "India is best among many developed countries in exploiting bio-technology like stem cells development, and DNA-related works. Two out of three vaccines for numerous purposes are being developed in India. "The minister said that early tsunami warning was best in India among all the countries and within 10 minutes after a quake we can tell the country and across the world about the intensity of the tremor. The minister inaugurated the Bio-Technology Hub and a Bio-Informatics Centre in Tripura (Central) University for which his ministry had earlier provided Rs.3.70 crore.The aim of the Bio-Technology Hub is to increase the awareness of biotechnology by providing training and teaching to the students as well as teachers from school level to college level.In addition, the state biotech hub has to improve the biological research quality using the modern equipment available in the facility as well as to produce skilled manpower.The Bioinformatics Centre envisages supporting the teaching activities of biology through application of Bioinformatics, to organise training, workshop for familiarising the application of Bioinformatics in teaching and research and to promote research work in Bioinformatics and to develop effective collaboration with experimental scientists.